The P8 is our best selling machine for a reason. Error reporting for fast, efficient troubleshooting. Contact us today and learn how Panther's P8 can immediately elevate your manufacturing, distribution, or fulfillment processes to increase throughput, reduce expenses, and decrease waste/loss for your business. Accommodates a 14” roll, with a low label sensor. Multiple applicator configurations make the P8 incredibly versatile for any labeling automation solution. Zero waste pnuematics – only uses air during operation. 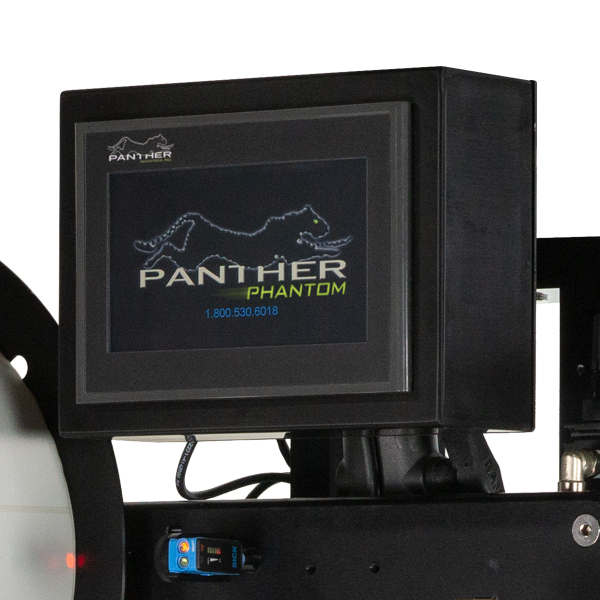 Featuring numerous applicator options, the Phantom can be custom-configured to your business needs. Brush or wrap options that directly applies a pre-printed label to a product or carton. A straight tamp, linear applicator for top and side label applications. For delicate applications where direct contact of the product is not ideal (e.g., food or light objects). For front or back label applications, also be configurable for top-apply labeling. Application around a corner when the label needs to be viewed on more than one side. For extreme, fast-paced label applications. Perfect for labeling tools, tubing, pipes, cables, or medical equipment. Allows two separate labels applied to a front or side location (or both), around a corner, or around a cylindrical object. A semi-automated process where items are labeled individually. Panther Industries has the expertise to design custom applicator options that do not fit into our standard configurations. © 2000- · Panther Industries, Inc. All rights reserved.